A real estate group says sales of existing homes rose from January to February in an unexpected boost for the slumping U.S. housing market as buyers took advantage of deep discounts on foreclosures. The National Association of Realtors said Monday that sales of existing homes grew 5.1 percent to an annual rate of 4.72 million last month, from 4.49 million units in January. It was the largest sales jump since July 2003. Sales had been expected to fall to an annual pace of 4.45 million units, according to Thomson Reuters. 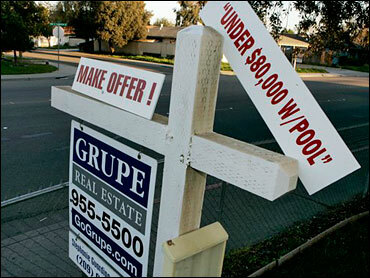 The median sales price plunged to $165,400, down 15.5 percent from $195,800 a year earlier. That was the second-lowest drop on record. Prices are down about 28 percent from their peak in July 2006.